Where is Real Al-Aqsa Mosque??!! Do you know what is Al-Aqsa Mosque and where is it located? Most glorified is the One who summoned His servant (Muhammad) during the night, from the Sacred Masjid (of Mecca) to the farthest place of prostration(Al-Aqsa Mosque), whose surroundings we have blessed, in order to show him some of our signs. He is the Hearer, the Seer. Also it is mentioned in Some Islamic narrations from prophet Mohamad that Al-Aqsa Mosque is the second holiest place after Masjed-al-Haram in Mecca. But what you think about the location of Al-Aqsa Mosque? 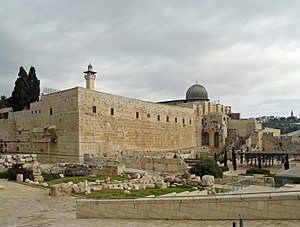 Many Moslems traditionally think that Al-Aqsa Mosque is the Mosque in the picture above. But that is the Dome of the rock and that is a totally incorrect conecpt! Many others traditionally think that Al-Aqsa Mosque that mentioned in Quran and called the second holliest place for Islam is the Mosque that is built on Temple Mount and called with the same name “Al-Aqsa Mosque”. But that is also incorrect! is bulit at least 70 years after Prophet Mohamad at 710 AD!! So that never cannot be the Al-Aqsa Mosque that called by prophet Mohamad? So is Al-Aqsa Mosque that is called by Prophet Mohamad, anything other than Temple Mount that is claimed by jews as the most holiest place for them? In some Islamic narrations Al-Aqsa Mosque is not on the earth and in somewhere in the heavens! So,why arab and Israelis fight for years for something that have no root in Islam religion???!!! I don’t defend Israel as a real governmental terrorist in the modern world. But I want to clarify an incorrect misunderstanding in Muslim community. Submission to reality! Believe to Jesus! Believe to Moses! Believe to Mohamad! Believe to Abraham! Submission to truth, Submission to reality, Submission to God, The only unseen God, is My religion. I belive to Abraham, to Moses and To Holy Jesus The Christ. I believe to Mohamad as well. Peace be uppon all of them and all the submitters to the reality. Do the people think that they will be left to say, “We believe,” without being put to the test? We have tested those before them, for GOD must distinguish those who are truthful, and He must expose the liars. Do those who commit sins think that they can ever fool us? Wrong indeed is their judgment. Anyone hoping to meet GOD, (should know that) such a meeting with GOD will most assuredly come to pass. He is the Hearer, the Omniscient. Those who strive, strive for their own good. GOD is in no need of anyone. Those who believe and lead a righteous life, we will certainly remit their sins, and will certainly reward them generously for their righteous works. Just think about the above! I’m Sooo happy to have you my dear Friends!!! Thanks a lot for your warm comments and prays for me! I really don’t know how to thank you! How you all are kind and made me proud and so happy that you accept me as your friends. I’m wondered about so many kindness of you all! I pray for all of you in this valued month Ramadan! And I hope happiness, success and peace for all of you one by one. A fire accident happen for me! We have gone to picnic to a village near tehran and for Chicken Kabab we wanted to alight fire and wow!!! Suddenly fire arose to my face and body and burned a lot! I hope everybody is ok and sorry for no reply during last days. I will try to update everything soon.